Aerial drones have been seen by many as a hi-tech toy or a curiosity, but the business applications for this new technology are expanding rapidly. A recent regulatory change by the Federal Aviation Administration has made it much easier for businesses to operate aerial drones for commercial uses. Prior to the ruling, companies needed a waiver (a 333 exemption) from the federal government to use drones commercially. The need for this exemption has been dramatically reduced by the new regulation (FAA Part 107). Under Part 107, a business technically only needs an operator who is at least 16 years old and has a remote operator certificate from the FAA. The drone used must also be registered with the FAA. With the easing of regulatory requirements, the market drones is booming: estimates are that by 2026, 10 percent of the global civilian aviation fleet will be unmanned. Annual global spending on unmanned aerial drones is expected to double to $11.5 billion by 2023. It is estimated that in 2015, 1 million unmanned aerial systems (UAS) were already in commercial operation. But with more and more businesses finding uses for aerial drones, questions are multiplying about the insurance liability that comes with the devices. 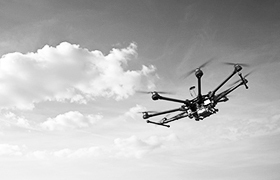 Aviation insurers are developing policies, but with such a rapidly growing technology, drone owners and operators can expect a long period of ongoing adjustment. So, what industries are currently using drones and what industries might start using them in the near future? Any industry that can use aerial imaging, of course, is now looking at these lightweight, remote-control devices. Agriculture, real estate, surveying for construction, conservation efforts are all areas where an eye in the sky can be helpful. There has been exploration of using drones for retail delivery but other systems may become more commonplace first—application of pesticides or other agricultural payloads, for example. In addition, industrial fishing companies are now using drones to help locate schools of fish. Energy companies use the drones not only for surveying but for gas and pipeline inspections. Insurance companies can use drones to check for damage on buildings or properties. After disasters drones can be used as mobile cell towers or to survey damage in unsafe areas. Educators are also interested in drones. High schools are always looking for ways to interest students in technology, and STEM (Science, Technology, Engineering, and Math) drones are seen as a natural for students, with many educational applications. Community colleges are also offering courses in aerial drone operation. The insurance issues from drone usage are like the technology itself: new, complex, and rapidly growing. A company might start exploring this new technology by hiring a drone and operator for a specific task. But an initial question to consider is whether to pay relatively big bucks for a professional service, or let Ted in accounting hire his daughter to do the relatively simple task? If your answer is the first scenario, congratulations. You have avoided a potentially serious liability issue. As tempting as it may be to see this technology on the same level as a hobby or a trendy new gadget, a company cannot take a chance with a device that can fall out of the sky and hit unsuspecting bystanders. Using a drone that was purchased for hobby use leaves a business vulnerable on many fronts. Most private homeowners policies do not cover aviation, so an amateur operator may have no insurance coverage. Using an inexperienced operator can add substantial risk to your company, such as interfering with other air traffic, endangering pedestrians, and invading someone’s privacy. Hiring a professional drone operator, with the proper certificates and insurance, is a smart investment if you are trying this technology for the first time. If your business buys its own drone (or drones), the drone should be treated as another business vehicle and needs its own policy. With most insurance carriers, each drone will be scheduled, or listed, separately. So far, few carriers are writing policies for drone fleets. Just as a company would have an auto insurance policy for a company car or truck, a drone that is company-owned needs an insurance policy that can cover multiple things: aviation liability for property damage (PD) and bodily injury (BI); hull coverage to protect the drone itself; and payload such as a camera. Batteries and spare parts can also be insured. If a drone carries cargo (which is different from “payload”), that cargo is usually excluded: companies can buy coverage for cargo in some instances, but the insurance company is going to review any such policy very carefully. In addition, any dispersed material (such as pesticides, in an agricultural setting) is excluded. Drone racing is also, not surprisingly, excluded from insurance coverage. If, instead of buying its own drones, a company uses a UAS service, the rules are slightly different. A company that hires a UAS operator with his or her own drone should make sure the operator has liability coverage. Another possible drone ownership scenario would be if your company owns the drone, but hires an operator to fly it. In most cases like this, an operator should have a “non-owned liability” clause in their coverage. A real estate agency hires various operators with their own drones. To protect its interests, the company requires a Certificate of Insurance (COI) from each operator, with the real estate company listed as additional insured, but it also purchases an annual non-owner policy for about $1,000 a year. If it turns out an operator has dropped his policy, the agency’s policy becomes primary. I own a drone business and my drone is insured but I’m hired by another drone company to fly their drone. My liability does not follow me so it would be wise to add a non-owner endorsement to my policy. It is also a good idea to have the hiring entity add me to their drone aviation policy as a pilot and additional insured. Finally, if your company hires an operator or aviation expert to do repair work on a company-owned drone (but not fly it), that operator should have a general liability policy. Additional coverage is available for specific risks or issues. It’s worth noting that personal injury coverage was hard to purchase by UAS operators for a while, but some carriers are now offering such policies. At this point, very few personal injury cases against drone operators have been successful. But even if an operator is vindicated, the defense costs can be crippling. There are also emerging insurance issues, such as cyber risk. One fear is that “maldrone” operators could take control of a drone from its original operators, or cause it to crash. Carriers are currently looking at possible coverage options that would address that risk. Insurance against terrorist acts or seizure of a drone in times of war is also available from some carriers. Some UAS operations are still illegal: flying at night, flying over pedestrians, flying a drone beyond the line of sight, and operation of multiple drones in a swarm. If a business needs an exemption from these rules, they must seek it from the FAA. Experts note that with such a rapidly changing technology that is still just beginning to get serious regulatory scrutiny, there can be sudden changes to insurance coverage as well. Insurers are still figuring out the new field, and will be for some time. Carriers are currently working with UAS associations and educational institutions to develop training and insurance standards. So far, there has been no major accident caused by a drone. If that misfortune should happen, regulators and lawmakers may feel pressure to tighten restrictions on this technology. Insurers and operators would no doubt be affected by such changes. Brokers who work with insurers and businesses to cover drone usage agree that the landscape is changing all the time. Businesses that want to take advantage of this growing technology will be best-served by working with a company experienced in this new field.